The TeraSys® provides a flexible solution for laboratory terahertz spectroscopy. It is based on organic crystals, to allow access to terahertz frequencies by optical down conversion yielding THz frequencies and efficiencies not available with conventional antennas. 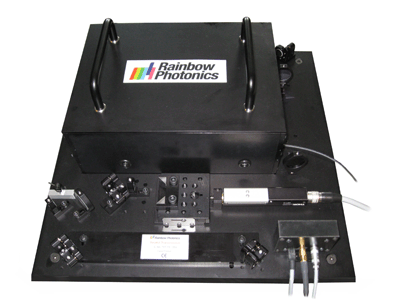 The TeraSys® includes all optical, mechanical, and electronic components for the generation and detection of THz waves such as delay line, terahertz generator, terahertz detector, optics, electronics, lock-in, custom made Er based femtosecond fiber laser, dedicated software and laptop. Spectroscopy and analysis of materials in the THz range up to 20 THz (depending on the pump laser).